Not sure where to start when choosing a sofa – and particularly a leather one – for your living room? There is a lot to consider, from picking the right colour and type of leather to deciding on the type of frame to suit your room. That's why we have pulled together a selection of the best leather sofas on the market for you to choose from. Be is a classic Chesterfield, or a slouchy sectional, you are sure to find the best sofa for your living room. There are several different types of leather to choose from: pigmented leather, aniline leather and semi-aniline leather all bring different characteristics to the table. Pigmented leather is durable and identified by its consistent surface – it means it lacks any natural blemishes like scars or stretch marks. Aniline leather is very natural looking, but just as luxurious in its appearance. Aniline sofas are completely unique as they retain the hides original surface. Aniline leather is usually less resistant to stains, so consider the likelihood of spillages before you make your final decision. Semi aniline leather is a blend between the two. It’s usually features the naturalness of pure aniline, but is more robust and resistant to stains. Use our guide to cleaning leather to find out more. You should also consider the cushioning of your sofa – it is where you are going to spend most of your relaxation time after all! Most cushions are filled with wadding, however some contain a blend of duck feather and manmade material for that ultra luxurious feel. Supportive cushions may also be pocket sprung for extra comfort. The frame, too, is important to the comfort factor of your sofa, and its appearance. Scandi-style sofas like our West Elm Mathias Leather Loveseat often showcase the frame as much as the cushioning, while classic family corner sofas have an in-built frame for hidden support. Frames are, for the most part, made out of wood, so consider whether you require dark, light or medium wood – you don’t want your new leather sofa to look out of place. 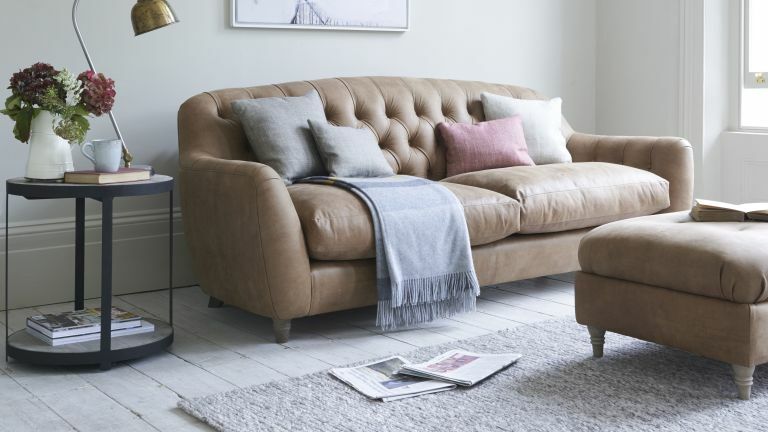 With all that in mind, we’ve browsed our favourite retailers including John Lewis, Laura Ashley and Furniture Village to bring you a varied collection of leather sofas. From stylish simple designs that would suit a modern living room to Chesterfield sofas for more traditional living spaces. Made from aniline leather, this sofa is wonderfully natural and soft for all-round comfort. Featuring scroll arms and buttoned cushions, its design is incredibly traditional, while its warm colour range is very classic. With thought having gone into every detail, the darkwood frame is finished by four beautifully carved and polished legs, which should be considered if you’re looking for this sofa to harmonise with any existing wooden furnishings. Offering an elegant look with its contrasting tan-dyed leather, solid wood frame and walnut veneer legs, this two-seater sofa comes in two other colours. There's also an armchair, three-seater sofa or corner sofa to match. The slightly splayed legs of the platform base has a mild retro feel which, when combined with the stitch detail on the sides and cushions, give it a contemporary look. Love it! If you’re looking for your star attraction, it could be here in this gorgeously vintage sofa. Shapely, and built with comfort in mind, it brings the design essentials to the forefront to offer a sofa that is stylish as it is perfect for purpose. With button detailing and a lightwood frame, this sofa is also about the finer details. There are 11 colours to choose from, so picking the right sofa for your home has never been easier (or harder, if there are several you like the look of). If you are trying not to slouch, this sofa comes with lumbar support installed, making in the ideal purchase for those with bad backs. While large in size, you can choose which end you want the chaise to best match your living room layout. Inspired by the '60s shapes and colours, this sofa is a bold statement piece that’ll certainly draw the eye. It features a smooth silhouette for a soft edge, and with detailing including the brass feet and combination foam and feather cushions, provides the right combination of style and colour. While the back may not be as plush as other sofas on our list, it’s high and supportive, ideal if you have suffer from an achy back. If you’re looking for pure upholstered luxury, we’re pretty sure this Italian designed power recliner leather sofa will fit the bill. With a powered recliner back and headrest, you can adjust the settings to your prefered level of comfort, while the soft leather and deep foam seats will bring a whole new level to your relaxation. There’s a range of colours and leather qualities to choose from, so this is a fully customisable sofa that promises to meet both your style and comfort demands. See more recliner sofas in our buyer's guide.